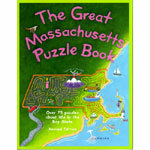 Travel through the Granite State via dozens of original puzzles, illustrated with lively line drawings. New Hampshire Counties Word Search, Great North Woods Cross-Outs, Moose Alley Maze, Lakes Region Criss Cross, Strawbery Banke, David Thomson Crossword, Concord - A Capital Place! and The Isles of Shoals Word Search are just a few children will enjoy. Perfect for car trips, beach days, rainy afternoons or any time children and grown-ups need a pick-me-up. Filled with vibrant illustrations and plenty of puzzles. Kids enjoy fun facts, activities and games about life in New Hampshire. Then test your skills! Over 95 pages of answers to "Are we there yet?" Learning doesn't have to be boring. Original puzzles explore Mount Washington, the Great North Woods, the Lakes Region, Strawbery Banke, David Thomkson, Concord, the Isles of Shoals, loons, moose, Lake Winnipesaukee, and the state's unique geography.There's a lot to cover so get started reading about the exciting Seacoast Area, the Christa McAuliffe Planetarium, famous 'Graniteers', waterfalls, covered bridges, action-packed ski slopes, and then 'vote early' up in Dixville Notch! Crosswords, logic games, secret codes, mazes, word puzzles and even some local recipes are included. If you’re looking for ways to entertain a grandchild, nephew or niece on a rainy day or long car trip, this book is the solution.